The second time I made it was in Dalarna, and I had somehow forgotten that I needed white wine for it. So, I had to resort to using red wine since that was what we had. Results.. well - stick to white wine. The flavor was pretty much the same, but the sauce was seriously purple. So, unless you mind eating with your eyes closed, or want a colorful dish... use white. 20 g (big bunch) of basil, shredded. Fry the meat as you normally would, which to me is in a mixture of olive oil and butter. Lift out of the pan, and allow to rest under tinfoil while you make the sauce. In the same pan, fry the shallots or onion gently for 2-3 minutes. Add the wine, and let reduce until about half is left. Add the tomatoes, creme fraiche and basil. Serve with pasta or new potatoes. The article suggested pairing it with a Pinot Noir - I haven't tried that though. This I absolutely have to try. So... simple and elegant! Oh yum, yum, yum! I will definitely try this. I have lots of basil in the garden, and someday those tomatoes will turn red. . . : ) Though I bet it would be good even without the tomatoes. Thanks for sharing the recipe. Wow!! This looks absolutely delicious!!!! But, what could I use instead of the wine??? Something non alcoholic....?? 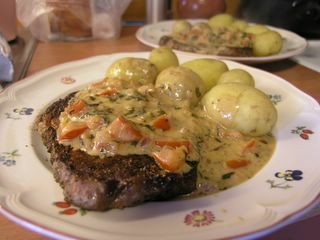 I searched the web over for a basil/wine cream sauce and this one was by far the most appealing. Got to get in the kitchen. I'll get back to you in a few hours to let you know how I liked it! I know this post is old, but if there is anyone considering replacing the wine with something else my advice is DONT! You cannot replicate the flavor. Alcohol evaportates at 172°F (78°C) so any sauce that is simmering will definately cook off the alcohol. It will take about 20 - 30 seconds. If for some unfortunate reason you're allergic to alcohol then I wouldn't recomend cooking this just encase there are small traces, although if it's due to religious beliefs, You're doing your Due Dilligence I'm sure a trace will not send you to hell. Besides it's about what your intentions are not the fact that you've consumed. If you want to enjoy food properly you have to be willing to try anything.